Trial reenactments are becoming an annual event in the Northern District of New York. For the second straight year, the Federal Court Bar Association hosted an historical trial reenactment for members of the public. This year’s choice was Russo v. Central School District No. 1, which is the story of a Rochester-area teacher who, in 1970, sued her school district for firing her for not reciting the Pledge of Allegiance in her homeroom class. On November 15, 2018, about 100 people braved a frigid, snowy night to watch the reenactment in the Ceremonial Courtroom of the James T. Foley U.S. Courthouse in Albany. 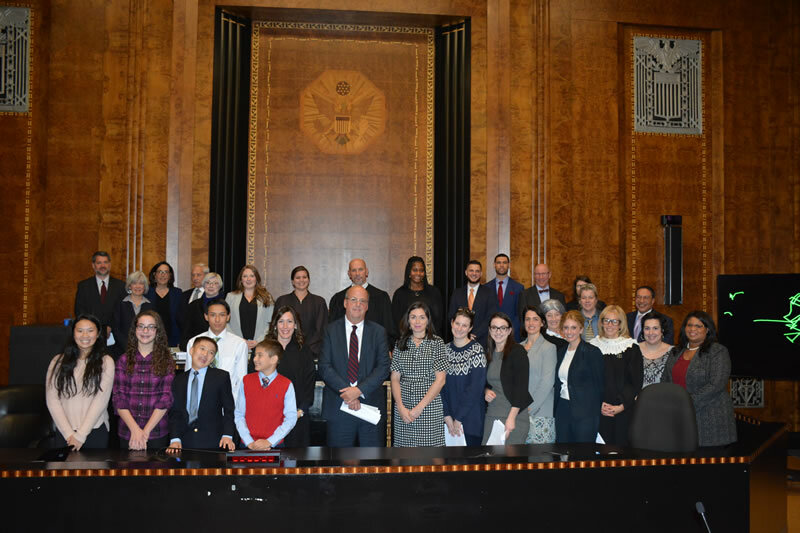 The FCBA organized and presented the event, which was directed by United States District Judge Mae A. D’Agostino. A catered reception, on the Courthouse’s first floor, followed the reenactment. Although Mrs. Adams [another teacher assigned to the same homeroom] saluted the flag and recited the pledge each morning with her class, Mrs. Russo did not. From her first day in school, when it came time to recite the pledge, Mrs. Russo rose and faced the flag, but neither recited the pledge nor saluted the flag. She simply stood at respectful attention, with her hands at her sides. … [T]here is no evidence in the record indicating that Mrs. Russo ever tried to influence her students to follow her example, and no evidence disclosing even a trace of disruption in the classroom as a result of her action. The students all knew the pledge and, under Mrs. Adams’s guidance, recited it each day, without incident. Mrs. Russo’s belief, the sincerity of which is unchallenged in these proceedings, was that the phrase ‘liberty and justice for all’ appearing in the pledge, which to most of us represents the spirit and abiding genius of our institutions, in her mind simply did not reflect the quality of life in America today. The District Court ruled against Ms. Russo. She then appealed to the Second Circuit, which reversed the District Court and ruled in her favor, finding that Ms. Russo had engaged in constitutionally protected activity. The Supreme Court did not take the case. The Second Circuit maintains a web page devoted to the case, available here. For the reenactment, judges, lawyers, Albany Law School students and grade school students were the cast members. United States Magistrate Judge Thérèse Wiley Dancks and United States Bankruptcy Judge Diane Davis served as the narrators. Molly Casey, an attorney at Maguire Cardona, PC, played Ms. Russo. David Rowley, managing partner of Cooper, Erving & Savage LLP, portrayed his own father Richard Rowley, who represented Ms. Russo. United States Attorney Grant C. Jaquith played Judge Harold P. Burke, who presided over the trial in the District Court. United States Magistrate Judge Daniel J. Stewart photographed the event. The script for the reenactment, distributed by an education initiative run by the Second Circuit, drew comparisons between Ms. Russo’s lawsuit and the contemporary situation of NFL player Colin Kaepernick, who, in 2016, chose to kneel rather than stand while the national anthem was played before the start of games. Albany Law student Kyle Ishman played Kaepernick, while Randy Treece, former United States Magistrate Judge and of counsel to the E. Stewart Jones Hacker Murphy law firm, played President Barack Obama, who opined on the Kaepernick situation. Judge D’Agostino opened the event by addressing the audience, thanking them for attending in spite of a snow storm and noting that the reenactment took no position on the merits of the case. 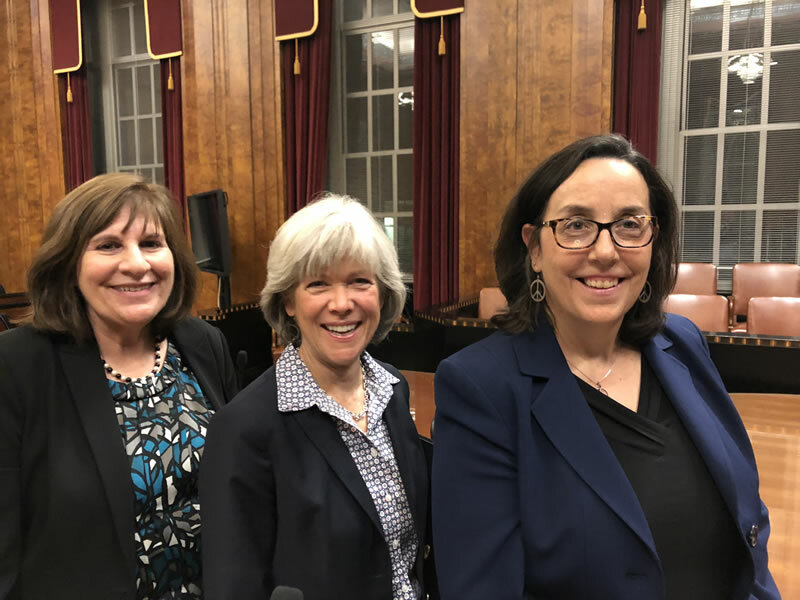 “What we want everyone to leave with here tonight is the knowledge that our federal courts are a place for civil discourse,” Judge D’Agostino said. The Russo reenactment will be coming to Syracuse in March.